Magic Alexa WIFI Smart LED Light Bulb, you can control it anywhere, don't need to be next to it. When you wake up at night and want to go to the bathroom, you don't be afraid. Note: Please keep in mind that the " SmartLife" App should be set up first before setting up the Amazon Alexa/Google home device,please also refer to user manual for more detailed steps. ✔Easy installation - There are 3 steps to start your smart life. Scan the QR code to download the APP, install the lamp and use the APP to control the Alexa bulb. 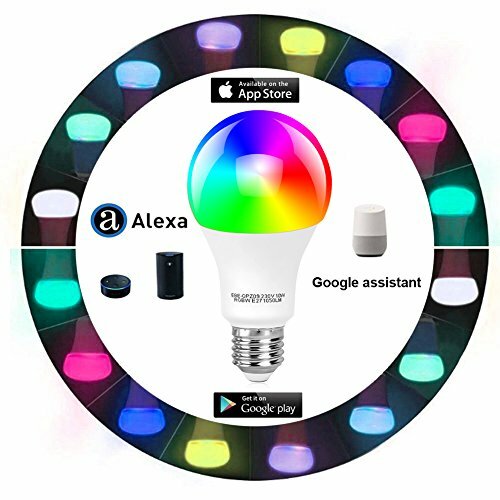 If you do not linked, it just a normal bulb, but once you linked it to your Amazon Echo/Goole home, you can control it with voice, Turns on and off the light, and the changing of the color which is very interesting. If you ready to get into home automation,it is a good choice. ✔Timing Function - Schedule your bulb to turn on or off at specific time. Wake up in the morning to your favorite colors. Come home to a bright and well lit home. During Vacation make it look like someone's home, even when you're not. Take control of your lighting from your Smartphone or Tablet. App allows you to control a single bulb, or group bulbs and control them together. ✔More safe - you can deny access to any of the permissions and it will still work. Control is easy to use. If you feel hubs aren't secure enough to be allowed to run items in your house. Now, it is a good news for you that our smart bulb do not need any hub. ✔Making life creative - you can set it to go on and off whenever you want even outside the home, as well as change the colors, brightness and intensity. You can use it like the desk light, floor light, wall light, chandelier, crystal fixture, garden lights, sconces. Especially in some festivals, birthday, Halloween, Christmas day, it will enliven the whole site and bring warmth. ✔Remote Control - Remotely turn on or off from anywhere. At home or when you outside, use Wi-Fi and mobile Networks to operate. Perfect for House. Compatible with Amazon Alexa Echo/Dot to make a well-lit home safety and accurately. Tonbux Smart bulb gives you hands-free voice control over your devices. Turn your lights or an entire room on/off when making a voice command. Does not work with Computer, IPad, Smarthing, Homekit. It only supports a 2.4G. If you have any questions about this product by TONBUX, contact us by completing and submitting the form below. If you are looking for a specif part number, please include it with your message.